1002 PAULY & CIE ITALIAN CARVED FIGURAL PHOENIX CHAIR: Finely detailed ebonized carved wood with full figure carved phoenix bird with its back as the seat, neck and head comprising half of the back. Rococo style foliate scroll top rail is not connected to the head. Metal tag near base reads ''Fabrique De Muebles, Pauly & Cie, Venise''. Floral needlepoint cushion. Overall measures 31'' h. x 28'' x 22''. 1003 SELF WINDING #9 OAK JEWELERS REGULATOR CLOCK: #9 oak case by The Self Winding Clock Co., pediment with carved center shell and scroll at either end. Door with round top glass, open lower glass. Marked metal 14 1/2'' dial and electric movement. Overall measures 70'' h. x 22 1/4'' x 8 1/4''. 1004 AMERICAN GOLDEN OAK TRIPLE BOW FRONT CORNER CABINET: Rich in details with upper section having a carved center crest, bowed doors of leaded and beveled glass. Beveled mirror backsplash separates the upper from the lower section that is comprised of center of three drawers over cabinet door, flanked by bowed glass front doors. Cabriole legs ending in paw feet on castors. 73'' h. x 48'' x 21''. 1005 A COMPLETE RUN SCOTT C1-C51 AIR MAIL STAMPS & MORE: This incredible, never offered collection is being sold as-found from a prolific collector, all in one scrapbook. Some blocks in plastic sleeves and then mounted to paper with tape, other blocks hinged, each page covered with loose wax paper. To include (Scott numbers provided) 4 C1 Jenny 6 cent block, 4 C2 Jenny 16 cent block, 4 C3 Jenny 24 cent block with left margin, 6 C4 propeller 8 cent side plate block, 4 C5 Mail insignia 16 cent, 4 C6 Jenny 24 cent lower plate block, 6 C7 Map 10 cent top plate block, 6 C8 Map 15 cent top plate block, 6 C9 Map 20 cent top plate block, C10 Spirit of St. Louis 10 cent side plate block, 6 C11 Beacon top plate block, 10 C12 Winged Globe in 2 bottom plate blocks (one plate block may be C16), 1 C13 Graf Zeppelin 65 cent with lower margin, 1 C14 Graf Zeppelin $1.30 with lower margin, 1 C15 Graf Zeppelin $2.60 with lower margin, 4 C17 Winged Globe 8 cent top corner plate block, 6 C18 Graf Zeppelin 50 cent top plate block, 4 C19 Winged globe 6 cent bottom corner plate block, 6 C20 China Clipper 25 cent top plate block, 6 C21 China Clipper 20 cent bottom plate block, 6 C22 China Clipper 50 cent bottom plate block, 8 C23 Eagle in 2 blocks, 6 C24 Winged Globe 30 cent top plate block, 1 four piece side block each of C25, C26, C27, C28, C29, C31 and C32, 4 C33 DC-4 5 cent top corner block, 4 C34 Pan-Am Building 10 cent side block, 4 C35 Statue of Liberty 15 cent side block, 4 C36 Bay Bridge 25 cent side block, 2 C37 DC-4 coil, 5 cent, 8 C38 New York City 5 cent in 2 blocks, 4 C39 DC-4 6 cent top corner block, 4 C40 Alexandria 6 cent top corner block, 2 C41 DC-4 coil 6 cent, 1 side block of 4 each C42, C43, C44, 4 C45 6 cent top corner block, 4 C46 Honolulu 80 cent side block, 4 C47 Powered Flight 6 cent side block, 4 C48 Eagle 4 cent side block, 4 C49 Air Force Anniversary 6 cent side block, 4 C50 Eagle 5 cent side block, 4 C51 Jet 7 cent bottom block. Also included in book are Special Deliver stamps to include 6 CE1 Eagle 16 cent top plate block, 6 771 Farley imperforate 16 cent bottom plate block, 8 CE2 Eagle 16 cent in 2 blocks, 4 FA1 Certified Mail 15 cent bottom plate block. All stamps ungraded and left as the previous collector mounted. None have been adhered to the best of our knowledge. 1008 FULLY FUNCTIONAL 1950'S COCA COLA 10 CENT VMC 33 VENDING MACHINE: Vendorlator Manufacturing Corp., 10 cent vending machine for 8 oz. bottles. Model V.M.C. 33, serial number 33-30051, classic red and white Coca Cola decals and stickers. Overall measures 52'' h. x 25 1/2'' x 18''. 1011 EMPIRE MAHOGANY SECRETARY BOOKCASE: Mid 19th century, ogee shaped pediment over 2 glass fretwork doors, wood interior shelves. Hinged writing surface with inset felt and pen tray over 3 full length drawers. Empire scroll stiles, overall measures 84 3/4'' h. x 43 1/2'' x 22 1/4''. 1012 WILLIAM DOUB ART NOUVEAU TIGER MAPLE DINING ROOM SET: Custom crafted specifically for a single client, this stunning Art Nouveau style set is made from tiger/curly maple and black walnut. To include 1) Double pedestal dining table, top with black walnut inlaid band. 29 1/2'' h. x 92'' x 44'', the two leaves 18''. 2-13) 12 side chairs with tan upholstery on front of back, brown upholstery on seat and back of back. 38'' h. x 20 1/2'' x 23''. 14) Breakfront china cabinet, top with mirrored center over 2 small drawers, open cabinets with adjustable shelves. Base with 3 drawers over 4 doors, black walnut handles. 94'' h. x 85'' x 20 1/2''. 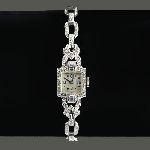 Original retail price was over $35,000.00. 1013 APPROX 15-25 YR OLD INDO-PERSIAN HAND KNOTTED WOOL RUG, 8'1'' X 10'1'': The black background of the main field and the main border with the large palmettes and flowers give this rug a dramatic look. The yellow/gold guard borders frame both the field and the main border. 1014 19TH CENTURY ROCOCO GILTWOOD & GESSO HALL TABLE: Carved gilt wood and gesso hall or foyer table in the Rococo style with foliate scroll, shell and floral decoration, on shaped legs. Shaped marble top not original to the piece. Overall measures with marble 36'' h. x 44 1/2'' x 21 1/2''. 1016 18TH CENTURY CHIPPENDALE KNEEHOLE DESK: Mahogany Chippendale period kneehole desk, single board top and sides, full length top drawers, central prospect door in kneehole with serpentine shaped shelf, flanked by 3 graduated drawers either side, replacement brass pulls. Shaped bracket feet, overall measures 30 3/4'' h. x 39'' x 20 1/2''. 1019 IRVING & CASSON HEPPLEWHITE STYLE INLAID SIDEBOARD: Serpentine top and front with string inlaid borders, 2 central drawers with the top drawer having velvet lined silverware compartments. Single right door, 2 left drawers, stiles and tapered legs with inlaid bellflowers. overall 37 1/2'' h. x 68 1/4'' x 24 1/2''. 1020 LUNT SUMMER SONG STERLING FLATWARE SERVICE: Approx. 71 pieces in the Summer Song pattern by Lunt Silversmiths to include 12 teaspoons (6''), 12 soup spoons (6 1/2''), 11 forks (7 1/4''), 11 salad forks (6 1/2''), 12 hollow knives (8 7/8''), 11 hollow butter knives (6''), tablespoon (8 1/4''), cold meat serving fork (8''). Approx. 66.5 troy oz. 1022 ASPREY ENGLISH STERLING 1937 CORONATION CUPS IN PRESENTATION BOX: Commemoration the coronation of King George VI and Queen Elizabeth, each small double handled silver cup with a different center medallion, measures 4 3/4'' dia. at handles. Sold in a fitted Asprey London presentation box, 11 1/2'' x 8 1/4 x 1 1/4''. Approx. 7.4 troy oz. 1024 ORNATE ROSEWOOD CONTINENTAL BREAKFRONT CABINET: Rosewood veneer all over, crest with ebonized center medallion and bellflower swags over 4 glass doors with octagonal fretwork decoration. 4 center drawers flanked on either side by full figure sphinx. Base with bowed center, 4 doors, all on ball and claw feet. Approx. 81'' h. x 74'' x 20 1/2''. 1025 CAMPHOR WOOD SEA CAPTAINS CHEST: Mid to late 19th century campaign style chest typically referred to as sea captains chests, brass mounts, handles, and escutcheon. Hinged lid, overall measures 13'' h. x 33'' x 13''. 1026 INTERNATIONAL ROYAL DANISH STERLING VEGETABLE BOWL: Vegetable with reticulated corners in the Royal Danish pattern by International Silver. Marked with D-229-2, measures 2'' h. x 10'', approx. 22.0 troy oz. 1028 HANS WEGNER TEAK PRESIDENT CREDENZA: Designed by Hans Wegner for Ry Mobler, teak case, double tambour slide doors, interior with 4 central drawers over open storage, adjustable shelves either side, tapered round legs. Ry mark on back, overall measures 31 1/4'' h. x 78 1/4'' x 19 1/4''. 1029 APPROX. 20-35 YR. OLD INDO-PERSIAN SERAPE PATTERN HAND KNOTTED WOOL RUG, 12' x 18': This rug has a striking look with its white center field and its bold colored central medallion and field corners. The salmon, black, rust colors are also found in the main border with its stylized flower heads and palmettes alternating with long crooked leaves linked by vines. This rug has a bold, well executed look due to the positioning of the colors and the crispness of the design. 1032 MAHOGANY BANDED INLAY DROP LEAF DINING TABLE: Banded mahogany rectangular top with drop leaf either end. Extends to hold four 12'' leaves. Table in smallest configuration measures 29 1/4'' h. x 42'' x 25 1/2''. 1033 PAIR OF MERCURY GLASS TABLE LAMPS: Baluster form mercury glass bodies on metal bases, double socket fixtures, 35'' h. x 6 3/4'' dia. Sold with cloth shades, 13 3/4'' h. x 16 1/4''. 1036 BRONZE SCULPTURE OF DANTE AFTER DELAIGUE: ''Dante's Inferno'' or Dante's Descent Into Hell, Bronze, signed as well as illegible small inscription near the base, 18.5'' h. x 12'' x 9''. 1037 MAPLE CHEST OF DRAWERS: Early to mid 19th century, 4 graduated drawers with tiger maple veneer and wood pulls, bracket feet, overall 40 1/4'' h. x 44'' x 20 1/2''. 1038 HENDERSON, Joseph Morris, (Scottish, 1863-1936): ''Berry Pickers'', Depicts an Open Field with Stream and People Picking Berries, Oil/Canvas, 20'' x 26'', signed J. Morris Henderson, lower right, period gilded gesso frame, 30'' x 36''. Joseph Henderson mostly painted coastal scenes and landscapes. 1040 PAIR EERO AARNIO ELEPHANT BOOT RATTAN CHAIRS: Comprising of 2 chairs and a side table, designed by Eero Aarnio, woven rattan bodies, marked on internal stretchers of chairs. Each chair measures 26 1/2'' h. x 32'', the side table 16 1/2'' h. x 14 1/4''. 1042 19TH CENTURY CONTINENTAL MAHOGANY ARMOIRE: Stepped cornice with rounded corners, 2 plain blind doors, shaped skirt and delicate shaped legs, brass hinges and escutcheon. Interior with 3 shelves and 3 center drawers. Overall 92'' h. x 55 x 22''. 1046 PARTIAL SET ALVIN CAMBRIDGE STERLING FLATWARE: Approx. 41 pieces in the Cambridge pattern by Alvin Silver to include 8 forks (7''), 5 salad forks (6 1/4''), 8 dessert spoons (7''), 2 round bowl soup spoons (6 3/4''), 8 iced tea spoons (7 1/2''), 2 demitasse spoons (4''), 8 hollow knives (8 7/8''). No monograms. Approx. 41.4 troy oz. 1047 MAHOGANY 4 POSTER PLANTATION BED: Circa mid 19th century, carved and turned posts with partial barley twist, shaped head board. Most likely a tester bed missing the top. Each post 79 1/2'' h. x headboard 58 1/4'' wide, side rails 72'' long. 1048 CARVED GILTWOOD FEDERAL STYLE MIRROR: Circa mid 19th century, carved and turned gilt wood frame, 2 part silvered mirror, overall 44'' x 23 1/4'' x 3''. 1049 APPROX 20-40 YR OLD INDO-PERSIAN HAND KNOTTED WOOL RUG, 4'X 5'11'': This rug has a traditional Herati variant design but it is done in such precision and with such a color combination that there is an ''Op Art'' effect. The design pops up to catch your attention. The blue field is covered in a tight pattern done in shades of red, blues, greens, pale yellow, and white. 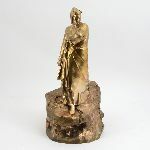 1053 ERTE LE MERVEILLEUSE BRONZE SCULPTURE: Figure of a Art Deco maiden in sweeping dress, incised Erte signature on top, limited edition, stamped 102/250 RK Int. Corp, copyright 1980. 15 1/2'' h. x 7''. 1054 ERTE IN THE EVENING BRONZE SCULPTURE: Figure of a Art deco maiden, incised signature on top of base, limited edition, stamped on base rim 198/300, Fine art Acquisitions, 1980. 19 3/4'' h. x 10 3/4'' x 6''. 1057 MID CENTURY ROSEWOOD TAMBOUR CABINET ON STAND: Rosewood exterior with double tambour door front, light wood interior with 3 silverware drawers and 5 adjustable shelves, over 3 lower drawers, all on a separate stand. Cabinet measures 38'' h. x 59 1/2'' x 17 1/4'', stand 14 1/4'' x 55 1/4'' x 15''. 1060 19TH CENTURY AUSTRIAN MAJOLICA PEDESTAL: Late 19th century, William Schiller & Son, Austria pedestal. Polychrome majolica glaze, decorated with wild roses, raised shell, foliate, fleur de lis grillage and floral bouquets in medallions, on 4 shaped feet. Applied maker's mark ''WS & S'' for Wilhelm Schiller & Son and numerically impressed ''6498 to underside of pedestal base. Identical to the one found in film star Marjorie Lord's Beverly Hills Estate. Overall measures 40 1/2'' h. x 13 1/2'' x 13 1/2''. 1063 APPROX 15-30 YR OLD INDI-PERSIAN HAND KNOTTED WOOL RUG, 6'1'' X 9': This rug has a bold design of large, vari-colored and type leaves. The pink, green, burgundy, blue, beige, and ivory colored leaves are very striking on the black colored field. The only flowers in this rug are found in the black ground border. 1067 TOWLE RAMBLER ROSE STERLING FLATWARE SERVICE: Approx. 140 pieces in the Rambler Rose pattern by Towle to include 12 forks (7 3/8''), 12 salad forks (6 7/8''), 24 teaspoons (6''), 12 soup spoons (6 1/2''), 5 iced tea spoons (8''), 7 round spoons (5''), 14 demitasse spoons (4 1/8''), 12 hollow knives (8 3/4''), master butter (6 7/8''), 11 solid butter knives (5 7/8''), hollow butter knife (6 3/4''), 6 lemon forks (5 1/2''), 8 cocktail forks (5 3/4''), serving spoon (8 1/2''), serving spoon (8 1/4''), serving fork (8''), pierced server (4 7/8''), ladle (6 5/8''), ladle (5 1/2''), jelly server (6 5/8''), infant set (fork 4 1/4'', spoon 4 1/4''), youth set (fork 6'', spoon 5 3/4''), cake server (10 1/2''), cheese server (6''), carving set (fork 8 3/4'', knife 9 3/4''). Sold in 2 silver chest, largest 3 3/4'' h. x 16 1/4'' x 11 1/4''. Approx 120.2 troy oz. 1069 APPROX 15-35 YR OLD PAKISTANI-PERSIAN HAND KNOTTED WOOL RUG, 9'2'' X 11'9'': This rug has a different, modern interpretation of some traditional Persian design elements. The blue/black colored field has colorful large medallions and palmettes, most with large curving leaves on either side, that form a pattern of rows. Each row has three complete designs. The colors used include yellow, green, pale peach, salmon, burgundy, ivory, and blue. The main border is a golden yellow color and the burgundy guard borders complete the rug. 1072 LARKIN QUARTER SAWN OAK SERVER: Attributed Larkin Furniture, oval beveled glass backsplash, 3 graduating center drawers flanked by curved glass door either side, front paw feet on castors. Overall measures 54 1/2'' x 48'' x 20''. 1074 REVERSE PAINTED TABLE LAMP: Patinated metal base marked 1876, double socket fixture, overall measures 22'' h. x 7 1/2''. Blue reverse painted landscape scene glass shade, overall 7'' h. x 16'' dia., 3 1/2'' fitter rim. 1075 MID CENTURY TEAK SECRETARY DESK: Shaped gallery, top with 2 drawers and 2 doors over pull out writing surface. Tapered sides, 3 full length drawers, tapered legs. Overall 40 3/4'' h. x 34 3/4'' x 18''. 1076 DANISH MID CENTURY LOUNGE CHAIR & OTTOMAN: Attributed to Ejner Larsen & Askel Bender Madsen, shaped back & seat with striped upholstery, metal support & 5 wood legs, tan upholstered cushions overall measures 37'' h. x 32'' x 34''. Matching tan ottoman measures 16 1/2'' h. x 22 1/2'' x 17 1/2''. Both marked Made in Denmark on hardware. 1077 APPROX 20-35 YR OLD PERSIAN BAKHTIARI HAND KNOTTED WOOL RUG, 9' X 11'11'': This rug has a variant of a Bakhtiari garden pattern with four smaller panels making up one larger panel. Rows of four panels divided by white colored bands (the streams) cover the field. White compass point-like circles link the vertical and horizontal bands. The panels (the garden), each have an individual tree or plant within. The white colored main border and the gold colored guard borders frame the main fields ''garden''. 1082 CHERRY SHERATON INLAID CHEST OF DRAWERS: Early 19th century cherry chest, 4 graduated drawers with wood knob pulls, banded inlay stiles, turned feet, pegged construction,, overall 49'' h. x 39'' x 21''. 1085 LARGE GENTLEMANS CHEST OF DRAWERS: Mahogany veneer front, large single top drawer over 3 step back graduated drawers, turned columns, caved foliate accents in panels. Front paw feet, overall 51 1/4'' h. x 48 1/2'' x 24''. 1088 BIRDSEYE MAPLE WORK TABLE / STAND: Square top over turned supports, open lower shelf with single drawers, turned legs. Overall measures 28 3/4'' h. x 17'' x 17''. 1089 GERMAN CARVED PAINTED AND GILDED GESSO ANGEL (PUTTI): 22'' h., probably 1st quarter 20th C.
1090 19TH CENTURY MAHOGANY EMPIRE SECRETARY DESK: Early to mid 19th century, mahogany veneer all over. Top level with hinged lid, open storage, locking small drawer either side. Desk opens with hinged lid on top, fall front writing surface, fitted interior with drawers and pigeon holes. Doors either side with shaped dividers and shelves. Base with single drawer over 2 doors, carved scroll stiles and front feet, overall measures 45 3/4'' h. x 45 1/2'' x 27''. 1091 2 POLYCHROME CARVED SANTOS FIGURES: 2 pieces total to include 1) Figure of St. Anthony of Padua holding a feather pen in one hand and the Christ child seated on a book in the other. Measures 11 1/2'' h. x 5 1/2'' x 4 1/2''. 2) Figure of the Virgin Mary, measures 12'' h. x 6'' x 5 1/2''. 1093 19TH CENTURY ENGLISH MAHOGANY LINEN PRESS: A marriage of the top and bottom, the 2 blind door top with oval flame mahogany veneer accents. Base with 2 drawers over 2 doors, bracket feet. Overall measures 9'' h. x 45 1/2'' x 23''. 1095 PAIR MARBO CARVED ALABASTER LAMPS: Carved urn form alabaster bodies over embossed gilt metal bases, double socket fixture, overall 41 1/2'' h. x 7 1/4''. 1096 VICTORIAN MAHOGANY 3 TIER SERVER OR BUTLERS TROLLY: Shaped crest with reticulated foliate design in center, middle shelf with 2 drawers, carved and fluted supports, all on castors. Overall measures 50 1/2'' h. x 48'' x 19''. 1099 12 LIGHT CHERRY CORNER CUPBOARD: 19th century, 12 light glass top door, white painted interior with 3 shelves, 2 blind lower doors, shaped skirt, canted corners, 85 3/4'' h. x 46 1/2'' x 21 1/4''. 1105 CHARLES HOLLIS JONES LUCITE, BRASS & GLASS COFFEE TABLE: Splayed Lucite base with brass center, rounded triangle shaped glass top, no visible markings. Base approx. 15 1/4'' h. x 25'' dia., glass 34'' x 50 1/2''. 1106 ITALIAN WHITE MARBLE FIREPLACE SURROUND: Variegated white marble, applied floral medallions at corners, fluted front stiles, overall measures 41 3/4'' x 53 1/4'' x 15 3/4''. Front opening 34'' h. x 39''. 1108 19TH CENTURY CARVED BED: Each post with ball finial carved twisted foliate motifs, both headboard and foot board with shaped crests, foot board with paw feet. Headboard measures 60 1/2'' h. x 57'', foot board 54'' h., side rails 78'' overall. 1109 APPROX 20-35 YR OLD TURKISH HAND KNOTTED WOOL RUG, 1'6''X 2'5'': This finely knotted little jewel has a dramatic prayer rug design. The center of the prayer niche has a black background that is outlined by pastel colored bands. The same soft colors continue into the borders as well as the motifs in the field. A tall vase of flowers sits under a hanging lamp and tall ewers or pitchers are placed in either side of the vase. The beautifully drawn and colored motifs really stand out on the black ground. 1112 18TH CENTURY GERMAN INLAID COMMODE: Serpentine top with banded inlay, 3 drawers each with foliate scroll string inlay, brass pulls and escutcheon, bun feet. Overall measures 29 1/2'' h. x 51'' x 25 1/2''. 1115 VICTORIAN CARVED OAK FAINTING COUCH: Carved shell in medallion and paw feet on castors, floral upholstery, 29 1/2'' h. x 74'' x 27 1/2''. 1116 GAMEWELL FIRE ALARM BOX & REGISTER: 2 pieces total to include 1) Gamewell cast iron fire alarm box with key, 17 1/4'' h x 12 1/4'' x 7''. 2) Heavy brass and glass Gamewell firehouse telegraph register, measures 13 1/2'' x 16'' x 6 3/4''. 1117 PAIR PAUL LEIDERSDORFF CARAVELLE LOUNGE CHAIRS: Chrome metal supports, painted black wood back and seats, tufted leather cushions. Unusual to find these popular lounge chairs designed for Cado with arms. Overall measures 28'' h. x 31 1/4'' x 30''. 1119 APPROX 15-30 YR OLD PERSIAN HAND KNOTTED WOOL RUG, 8'4'' X 11'2'': This room-size rug has a small central medallion in shades of blue around a black center and spandrels at either end. The red field is completely covered by a tight repeating pattern that forms diamonds and squares. The predominate color over the white ,blues, and black of the pattern is the red of the ground. Multiple guard borders of red, green, and blue surround the black main border. 1120 TWO LILLIAS KLUTE PUERTO RICAN LANDSCAPE PAINTINGS: 1) The Little Beach, Oil/Canvas, 22 x 30, signed , titled and marked San Juan, Puerto Rico January 1968 verso, framed, 26.5'' x 34.5'': 2) The Century Box at Puerto San Juan, Oil/Canvas, 24'' x 30'', signed lower right, signed, titled and dated verso 1968. 1121 WESTMORLAND STERLING SERVICE FOR 8: Approx. 45 pieces in the Lady Hilton pattern by Westmoreland silver to include 8 forks (7 1/4''), 8 salad forks (6 1/4''), 16 teaspoons (6''), 8 hollow knives (8 3/4''), 2 tablespoons (8 1/8''), ladle (6 1/2''), sugar spoon (6''), master butter knife (7''). Approx. 47.1 troy oz. 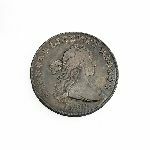 Sold with a silver chest, 3'' x 14 3/4'' x 10 3/4''. 1123 APPROX 15-25 YR OLD FLATWEAVE HAND WOVEN WOOL RUG, 5'6'' X 8'1'': The field of this interesting rug consists of a series of different size and color panels. Each panel has different scenes which include stylized trees, plants, and animals including lions and birds, and a building or two. The main border has a pale red ground with alternating birds, funky trees, and hexagons. This is a fun interesting rug. 1125 PACE COLLECTION 9' LONG MEDINA DINING TABLE: Tiger maple veneer with cut in corners, ebony veneer tapered legs and center support column. 29 1/4'' h. x 108'' x 48''. Sold with a copy of the original receipt for $14,800. 1128 MAX, Peter, (American, 1937-): Blushing Beauty on Blends, Mixed Media with Acrylic Painting on Paper, image size 10'' x 8'', signed lower right, framed, 20.75'' x 34.5''. 1129 MAX, Peter, (American, 1937-): Sage and Profile Collage, Mixed Media with Acrylic, image size 11.25'' x 8.5'', signed lower left, custom frame in matting, 30'' x 30''. 1132 HEAL & SON EDWARDIAN MAHOGANY DESK: Rectangular top border with veneer trim over central drawer with 2 drawers either side, brass pulls, drawer fronts with bordered trim. Turned legs, brass feet with castors. Heal & Son London mark center drawer. Overall 31 1/2'' h. x 47 1/2'' x 22''. 1134 NAVY BLUE LEATHER EKORNES STRESSLESS RECLINER AND OTTOMAN: Navy blue leather upholstery with bentwood bases, each marked with Ekornes. Recliner measures 38 1/2'' h. x 35 1/2'' x 33'', ottoman 16'' h. x 19'' x 14 1/2''. 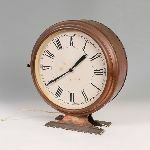 1135 COPPER DOUBLE SIDED STATION CLOCK: Copper case, unmarked painted metal dials, electric movement, wall bracket mount. Overall measures 18'' including bracket x 16''. 1136 PAINT DECORATED SETTEE: Early 20th century, shaped top rail, carved back splats with foliate medallions, turned supports. Carved and shaped front legs, flaking grey over green and red paint, striped upholstery. Overall 30'' h. x 40'' x 21 1/2''. 1137 ANTIQUE PERSIAN HAND KNOTTED WOOL RUG, 5'2'' x 6'1'': We believe this to be a Kurdish Persian rug. It has an amalgam of various archaic design patterns, including a Herati design, which have been put together to create an interesting and different combination. The deep salmon colored field makes a good background for the blues, reds, white, and black colored motifs that cover it. The white ground main border also has a striking design of a black continuous angled vine that has large flower heads that are all ''growing'' in the same direction. 1138 CARVED RENAISSANCE REVIVAL SAVONAROLA CHAIR: Profusely carved in the Italian Renaissance revival style, top rail with center medallion flanked by 2 dragons, lower rosettes. Shaped arms with figural lion masqueron over foliate scroll at joints, fish scale, lion head hand holds. Shaped X form leg, center winged cherub masqueron, matching fish scale, rosettes at front feet. Green paisley fabric, overall measures 40 1/2'' h. x 26 1/2'' x 26''. 1143 APPROX 15-25 YR OLD CHINESE HAND HELD MACHINE TUFTED WOOL RUG, 7'5'' X 9'5'': This decorator type rug has a large floral borderless design. The motifs are sculpted and the colors are shaded to add detail to the rug. The bright cheerful colors rest on a pale grey ground. 1144 RICHARD SCHULTZ FOR KNOLL PETAL SIDE TABLE: Designed by Richard Schultz for Knoll, 8 petal wood top over painted white aluminum base, Knoll label under top. Overall measures 19'' h. x 16''. 1147 CARVED FOYER / SOFA TABLE: Elongated rectangular top, shaped supports with floral swags at knees, carved and shaped stretcher, scroll feet. Overall measures 30 1/2'' h. x 24'' x 70''. 1152 LOUIS XV STYLE PAINT DECORATED ABBATANT: Marble top, swelled sides and front, painted landscape genre scenes in panels on drop front and sides, gold toned cast metal accents all over, open interior storage, shaped legs. Overall measures 54'' h. x 24'' x 14 1/4''. For a similar, but not identical match, see next lot 1152A. 1152A LOUIS XV STYLE PAINT DECORATED ABBATANT: Marble top, swelled sides and front, painted landscape genre scenes in panels on drop front and sides, cast metal accents all over, open interior storage, shaped legs. Overall measures 54'' h. x 24'' x 14 1/4''. 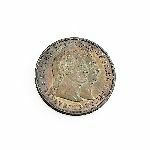 For a similar, but not identical match, see previous lot 1152. 1159 CONTINENTAL GUILLOCHE DRESSER SET IN CASE: 2 piece hand mirror (10 3/4'') and hand brush (9 1/8''), nicely detailed blue guilloche enamel, unmarked as to maker or metal content. Sold in a faux ray skin case with fitted interior, 2 1/2'' h. x 13 1/2'' x 8''. 1168 PAINTING ON TIN OF CHRIST AND SAINT: Oil/Tin, 10.75'' x 9.75'', carved and gilded gesso frame with mirrored inserts 17'' x 15.5''. 1175 5 PIECE ESTATE COLLECTION OF STERLING ITEMS: 5 pieces total to include 1) Whiting bowl with fluted sides, embossed leaf decoration, 2'' h. x 8 1/2''. 2) Saart Brothers footed tray with reticulated rim, 1 1/4'' h. x 10''. 3) Poole Chippendale tray, monogrammed B, 9 3/4'' dia. 4-5) Durham open creamer and sugar. Approx. 41.7 troy oz. 1178 EXCEPTIONAL SHIP PORTRAIT OF FREDERICK BILLINGs, 1921: Oil/Canvas, 16'' x 26'', Painted by Belle Lovell, done in 1921, signed and titled on stretcher verso, framed, 19'' x 28.5''. the Billings launched in 1885 out of Rockport, Maine. 1184 APPROX 20-35 YR OLD INDO-PERSIAN HAND KNOTTED WOOL RUG IN TABRIZ PATTERN, 8'1''X 10'1'': This rug has a well-balanced design and harmonious color choices that help to make this a lovely rug. The deep red field has a pattern of palmettes radiating out from a small central medallion. The palmettes are linked by vines with leaves and flowerheads. All the motifs are done in colors that include shades of blue, white, green, and beige. The deep blue main border and the white, pale blue and red guard borders complete the design. 1188 WELLER HUDSON IRIS VASE SIGNED HUNTER: Cylindrical vase with iris flower decoration on front and back, signed by the artist Jean Hunter, marked Weller Pottery on base. Overall measures 9 1/4'' h. x 4''. 1189 APPROX 15-30 YR OLD PERSIAN HAND KNOTTED WOOL RUG, 9'10'' X 13'10'': This large room size rug has a traditional pattern with some more modern colors used alongside traditional ones. The central medallion has a deep red inner field surrounded by a wide grey band. There are small spandrels at each end that also rest on the deep red field. A variant of the Herati pattern covers the field with a repeating small design of alternating diamonds and squares. The white, grey, turquoise, and black colored motifs really stand out on the deep red field. 1190 PINK ONYX TOP ITALIAN FOYER TABLE: Serpentine pink onyx top over carved gilt wood base. Shaped skirt with rococo style foliate scroll design, shaped legs and stretcher. Marked Made in Italy on back support, overall 64 1/4'' h. x 45 1/2'' x 14 1/4''. 1195 GEORGE NELSON MODERNICA CIGAR BUBBLE LAMP: Latex over metal ribs, chrome heat cap and lower ring. Measures 21 1/2'' h. x 11 1/2''. 1197 EMPIRE CHEST OF DRAWERS: 2 half drawer with serpentine shaped fronts over 3 full length drawers. Shaped bracket feet, wood pulls, 39'' h. x 43 1/4'' x 19 1/2''. 1200 MAHOGANY MARBLE TOP ROUND OCCASIONAL TABLE: Top with green variegated marble affixed to center, brass gallery. Skirt with applied decoration, cast caryatid busts at joints to tapered legs, open lower stretcher shelf, acanthus leaf feet. Overall measures 31 1/2'' h. x 33 1/2''. 1202 SAGENDORF, Bud, (American, 1915-1994): 2 original ''Thimble Theater Starring Popeye'' artwork for Sunday comic strips to include 1) Featuring Popeye, Olive Oyl, and Wimpy, dated 5-1. Popeye gives Wimpy $1000 dollars to leave him alone for a year. Sight size with markings in top margin 15'' x 22'', framed 20 1/2'' x 27 1/2''. 2) Featuring Popeye and Swee'Pea, no visible date. Popeye sends Swee'Pea outside to play, Swee'Pea meets a girl and gives her a can of spinach as a present to end with bad results. Sight size with markings in top margin 15'' x 21 3/4'', framed 20 1/2'' x 27 1/2''. 1203 1950'S PREMIERE GUM AND CARD VENDOR MACHINE: 5 cent bubble gum and card vending machine manufactured by Oak Mfg. Co. Inc., California. Red painted aluminum case, center gumball dispenser with card dispenser either side. Comes with gumballs (age unknown) and vintage 1960's Vikings cards. Measures 14'' h. x 13'' x 5 1/2''. 1204 LARGE FULL BODY TAXIDERMY ATTACKING LION MOUNT: Nicely mounted full body lion in leaping attack mode on a composite plinth with grasses. Overall measures approx. 69.25'' h. x 83 1/2'' tip of tail to front paw, x 50''. This item cannot be shipped or sold outside the state of Florida. 1209 RACKHAM, Arthur, (British 1867-1939): Illustrator for ''The Ingoldsby Legends or Mirth and Marvels'' book by Thomas Ingoldsby (pen name of Richard Harris Barnham). Limited edition publication of 560 volumes, signed by the illustrator, this is #32 of 50 published for the American market by E. P. Dutton & Co. New York, 1907. 24 tipped in illustrations, 12 full page illustrations, gold embossed vellum covers and spine. Measures 10 1/2'' x 9'' x 2 1/2''. 1210 L. CASELLA ENGLISH WHEEL / BANJO BAROMETER: Scroll pediment, burl walnut veneer case, top thermometer with silvered dial. Lower round silvered barometer dial marked '' L. Casella, Makers to the Admiralty & Ordinance, London. Convex front crystal. Overall measures 36'' h. x 10 1/2'' x 2''. 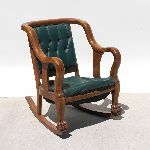 1214A OAK ROCKER FROM WORLD'S FAIR: Shaped golden oak arms and supports, carved paw feet over rockers. Green leather seat and back, remnant of original leather tag with partial World's Fair stamping. Overall measures 34 1/2'' h. x 27'' x 34''. 1216 HYDE, Helen, (American, 1868-1919): ''A Monarch of Japan'', Color Woodcut, sight size with margins 19.5'' x 6.25'', pencil signed lower right, copyright 1901 lower left, framed 23'' x 11''. Helen Hyde is well known for her color etchings. 1218 BARCONS, Zulema, (American, 20th C.): ''At the Museum'', Oil/Board, 13.75'' x 10.5'', signed lower right and dated. '31, titled lower left ''H. Matisse Exhibition'', Argent Gallery label affixed verso, period frame, 20'' x 15''. 1220 NEIL ASPINALL SIGNED BEATLES PLEASE PLEASE ME ALBUM: Parlophone Records PMC 1202 original Beatles Please Please Me album bearing signatures of all 4 Beatles, unfortunately done in the hand of Neil Aspinall, driver, confidant, and manager of the Beatles. We believe this album to be a 4th pressing, circa summer of 1963-January of 1964, with the Ernest J. Day front cover. Sold with original paper slipcase and a plastic protective cover from Smyths Records in Ireland. In sleeve 12 1/2'' x 12 1/2''. 1225 WALKER, Charles, (American, 20th Century): Florida Highwaymen male and female cardinals in a pine tree, Oil/Canvas, signed lower right, 30'' x 24'', framed 35'' x 28 1/2''. Walker prefers to paint more realistic wildlife paintings over the standard Highwaymen landscapes. 1229 EDISON AMBEROLA 30 CYLINDER PHONOGRAPH PLAYER: Oak case, rank wind Amberola 30 movement, serial number SM120457, grain painted front metal plate. Sold with a cylinder disc, overall measures 12 3/4'' h. x 16'' x 12 1/2''. 1229A 104 CYLINDER ROLLS FOR EDISON PLAYER: Approx. 104 rolls total, primarily 2 minute rolls, some with original packaging. 1231 EXHIBITED FLORIDA PAINTING SIGNED HATTON: Depicts a Boat in Dry Dock for Repair, with African American working in the boat, Oil/Canvas, 20'' x 24'', signed in lower margin, painted frame, 26.5'' x 30.5'', Miami Boat Show Art Exhibit partial label verso. 1232 EMPIRE GENTLEMANS CHEST OF DRAWERS: Mahogany veneer case, 2 drawer top over single full length drawer with shaped front over 3 full length graduated drawers, wood pulls. Empire scroll stiles, top appears to have had a mirror at some point, now missing. Overall measures 44 3/4'' h. x 42'' x 25 1/2''. 1233 SEMI-ANTIQUE PERSIAN BIJAR HAND KNOTTED WOOL RUG, 4'3'' x 6'4'': This Bijar has a salmon colored central medallion in a darker blue ground that has paler blue corners. The field is covered with vine linked flowers and leaves in peach, salmon, blues, ivory, and yellow, like the colors found in the borders of the rug. 1242 HOFF, Margo, (American, 1912-2008): Abstract Composition with Child Chasing Butterfly, Oil/Masonite, 30'' x 20'', signed lower right, framed, 39'' x 27''. Margo Hoff is known for her abstract art. 1243 APPROX 25-45 YR OLD PAKISTANI HAND KNOTTED WOOL RUG, 2'10'' X 4'8'': This rug has vibrant colors and an interesting geometric design. The flaming orange/red field has two large medallions in the center and six half medallions, three on each side of the field done in colors that include a purply blue, green, black, and red. The medallions are outlined by a border of white. The purply blue border of the field has repeating large flower heads. 1247 SEMI-ANTIQUE PERSIAN BIJAR HAND KNOTTED WOOL RUG, 4'6'' x 6'11'': This Bijar has a deep blue field with a pale blue and burgundy central medallion and a profusion of various flowers and leaves covering the rest of the field. Also there are vases of flowers that spring from each corner into the field. The red ground of the main border has a repeating palmettes and leaf design. This is an attractive sturdy rug. 1248 AUTUMN HAZE RANCH MINK STOLE JACKET: Lovely stole style jacket with a shawl collar. Size 2-4. Professionally cleaned and stored. Sold with mesh dust cover. 1259 FISCHER ZSOLNAY RETICULATED CENTER BOWL / COMPOTE: Pre-1890 polychrome decorated with profuse pierced body, handles and base. Bees and floral motif interior. Blue underglaze Fischer J, Budapest mark and impressed 1670. Measures 12'' h. x 19 1/4'' x 7''. 1264 CIVIL WAR ERA P. R. WINN BOSTON SNARE DRUM: Civil War era or possible slightly later, maple shell and loops, marked around vent hole ''P. R. Winn, ? ?10 Court Street Boston in shield with federal eagle, figures and drums. Overall measures 11'' h. x 17 3/4''. 1265 CHINESE POLYCHROME PAINT DECORATED LEATHER TRUNK: Late 19th to early 20th century paint decorated on leather clad 3 sides and top in panels with floral borders. Top with musical instruments, front with figures and tigers, sides with flames. Iron hardware to include ring hinges, clasp and hinges. Overall measures 17 1/2'' h. x 37 1/2'' x 16''. 1266 FINE BALINESE CARVING OF VISHNU RIDING GARUDA: Finely detailed heavy wood carving of the Hindu god Lord Vishnu riding his mount Garuda standing atop dragon turtle with salamander and mythical creature. Overall measures 22 3/4'' h. x 9'' x 11''. Sold with a wood stand, 6'' h. x 11 1/4'' x 11 1/4''. 1268 MORITZ ZDEKAUER GAME BIRDS PLATTER AND PLATES: Late 19th / early 20th century serving platter (16 3/4 x 11'') and 12 plates (8 3/4''), hand painted with various game birds including pheasant, quail and more. Sold with 2 unmarked oval bowls with ducks. 1271 LARGE MARQUETRY INLAID DUTCH LANDSCAPE: Scene Depicts Mother and Daughter Looking into Distance upon Window, unsigned, overall measurements with frame, 18'' x 53.5'', no visible signature. 1274 PAIR JACOBEAN STYLE LEATHER SIDE CHAIRS: 19th century, turned legs and stretcher, tacked leather seats and backs. 37 1/2'' h. x 20 1/2'' x 19 3/4''. 1277 COLLECTION OF FIRST EDITION FRANKLIN PRESS BOOKS: 21 books from the Franklin Library First Edition Series with embossed leather covers to include A Distant Mirror: The Calamitous 14th Century, A God Against the Gods, An American Prophet, Black Night, White Snow: Russia's Revolutions 1905-1917, Collected Poems W. H. Auden, Dubin's Lives, Evidence of Love, Getting Up and Going Home, Good As Gold, History, Picture Palace, Roosevelt and Churchill, Selected Letters of William Faulkner, Selected Poems Robert Penn Warren, Sons Come and Go, Mothers Hang In Forever, Sophie's Choice, The Alcestiad, The Bold and Magnificent Dream, America's Founding Years 1492-1815, The Destinies of Darcy Dancer, Gentleman, The Unmade Bed, Women of Crisis. 1280 VINTAGE HORSE & SULKY COPPER WEATHERVANE: Patinated copper molded figural seated harness racer on a sulky and running horse, 20th century production, with directional and stand. Weathervane measures 18'' h. x 33 1/2'' x 11'', stand 56'' x 10 1/2'' x 8'', directional closed 22 3/4''. 1283 MORRIS, Theodore, (American, 20th C): ''The Teacher'' (Tocobaga Tribe), Oil/Canvas, 24'' x 36'', signed lower right, signed, titled and dated 2000 verso on stretcher, framed, 30'' x 40'', illustrated in the book Florida's Lost Tribes. Theodore Morris was intrigued by the Native Americans of Florida and use them as inspiration for his work. 1288 FLOOR LENGTH BEAVER COAT WITH AMAZING SHAWL COLLAR: Label reads Caskie Fabulous Furriers, Canada. Approximate measurements: 29'' from neck to sleeve cuff/hem, 16'' across back and 47.5'' length from neck to hem. Approx size 10. 1289 ERMINE FUR LADIES JACKET, AUBURN BROWN: Jacket is fully lined and has hook and eye closures. Approximate measurements: 25'' from neck to sleeve cuff/hem, 14.5'' across back and 22'' length from neck to hem. Approximate size 2-4. 1292 3 PIECE COLLECTION OF LALIQUE CRYSTAL: 3 pieces total to include 1) ''Elizabeth'' vase with doves and foliate motif, 5 1/4'' h. x 5 1/2''. 2) Small Honfleur dish, 5 3/4'' dia. 3) Chrysis frosted glass figure, 5'' h. x 6 1/4''. 1296 1951 LEICA IIIf CAMERA WITH f5 LENS: Serial number 566880, Ernst Leitz Wexlar faux sharkskin case, Summitar f=5cm 1:2 lens, leather outer case. 1297 MARX HONEYMOON EXPRESS & WOLVERINE SHOOTING GAME TOYS: 2 pieces tin litho toys to include 1) Marx ''Honeymoon Express'' key wind train toy, missing airplane, no box. 2 1/4'' h. x 9 3/8'' dia. 2) Wolverine Shooting Gallery with the original box. Game measures 6 1/2'' h. x 18 1/4'' x 11 1/2'', box 5 1/2'' x 18 1/2'' x 11 1/2''. 1299 APPROX 15-30 YR OLD TURKISH HAND WOVEN WOOL FLAT WEAVE RUG, 5'11'' X 9'7'': The ivory field has four rows of two each large diamond shaped medallions done in colors of pale blue and orange, dark blue and yellow, pale green and orange, and orange and pale blue. Smaller beige and pale green colored motifs run up each side of the field. The border as a bold geometric motif on an orange ground. 1301 JEAN POUYAT LIMOGES HAND PAINTED SWALLOW VASE: Matte cream ground, on side decorated with 4 sparrows in flight, iris blooms verso. Scroll handles and base with gilt, marked on base with circa 1890-1932 JPL over France, artist initials BDR and dated '92. Overall 9 1/2'' h. x 9''. 1302 M. REDON 1893 WORLDS FAIR EXHIBITED CHOCOLATE SET: Marked on base with M. Redon Limoges mark and special ''1893 World's Fair'' mark. 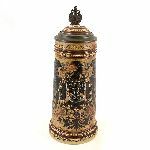 Set to include a lidded chocolate pot with cream embossed body, hand decorated with floral and ribbon motifs, gilt accents. 8 cups with matching embossed body and motif, 8 saucers with scalloped rim and matching decoration. Pot measures overall 9 1/4'' h. x 6 1/2'', cups 2 3/4'' h., saucers 4 1/2''. 1303 STRAUSS HAM AND SAM TIN LITHO WIND UP TOY: Hamm and Samm ''The Minstrel Team'', key wind, tin lithography, by The Ferdinand Strauss Corporation, New York, Patented 1921. Overall measures 8 1/4'' h. x 6 1/2'' x 5 1/4''. 1304 JENSEN STEAM ENGINE WOOD WORKING FACTORY: Jensen Style 25 electric heated steam engine, piston, power wheel, Wilesco line shaft, Wilesco hack saw, unmarked drill press. All mounted to chipboard. Overall with chimney measures 9 1/2'' h. x 20 3/4'' x 13''. 1305 WILESCO DAMPFTRAKTOR STEAM ENGINE IN ORIGINAL BOX: Wilesco #D405, blue body, white top, red wheels, wide rubber bands on wheels. Tractor overall 8 1/4'' h. x 11 1/2'' 6'', original box 8 1/4'' x 11 3/4'' x 6''. Sold with a small assortment of accessories. 1306 MAMOD SINGLE PISTON STEAM BOILER ENGINE: Brass boiler, single piston steam engine, Mamod and TOV labels. Measures 7 3/4'' h. x 12'' x 10 1/4''. 1309 CORNERSTONE OAK DROP LEAF DESK: 3 Drawers, casters, closed it measures 24'' l x 23.25'' w x 26'' h, open it measures 48'' w.
1312 18TH CENTURY BLANKET CHEST: Peg and dovetail construction, interior with single box, replacement hinges, 2 drawer base, overall 26'' h. x 53 1/2'' x 22 1/4''. 1314 PERUVIAN SUNBURST STYLE WALL MIRROR: Layer levels of inset mirror panels in carved gilt wood, overall measures 30'' dia. x 3 3/4'' deep. 1316 NEIMAN, Leroy, (American, 1921-2012): ''Jack Nicholas Teeing off'', Serigraph, sight size 27.5'' x 21'', pencil signed lower right, 77/300 lower left, framed, 85'' x 28''. Leroy Neiman is known for his vividly colored expressionist paintings. 1317 NEIMAN, Leroy, (American, 1921-2012): Downhill Skiing, Serigraph, sight size 27.5'' x 13'', pencil signed lower right, 205/300 lower left, framed, 34.5'' x 19.75''. Leroy Neiman is known for his vividly colored expressionist paintings. 1319 NEIMAN, Leroy, (American, 1921-2012): NHL Hockey Game, Serigraph, sight size 23'' x 29.5'', pencil signed lower right, 199/300 lower left, framed, 30.5'' x 37''. Leroy Neiman is known for his vividly colored expressionist paintings. 1320 NEIMAN, Leroy, (American, 1921-2012): Football Game, Serigraph, sight size 23'' x 28.5'', pencil signed lower right, 155/300 lower left, framed, 30'' x 36''. Leroy Neiman is known for his vividly colored expressionist paintings. 1321 COLLECTION OF SWAROVSKI CRYSTAL FIGURES: To include 1) Clam shell with ''pearl'', 2 1/2''. 2) Birdbath with crystals, 3 1/2'' dia., with box. 3) 2 foals / horses group, 4 3/4''. 4) Heart with ribbon, 2'', with box. 6 sided glass and mirrored display case, 14'' x 9''. 1323 COLLECTION OF SWAROVSKI CRYSTAL FIGURES: 1) Crystal Memories Journeys carriage, 3'' long, with box. 2) Fish on frosted coral, 3 1/4'' h. 3) 3 fish group, 3'' long. 4) Single fish, 1 5/8'' long. 5) Pyramid, 2 1/4'' h.
1324 APPROX 20-40 YR OLD TURKISH HAND KNOTTED FAUX SILK OR COTTON RUG, 4' X 6': This rug has a central medallion that looks like a large ivory and green flower that has a red/orange center that rests on a red orange field. Palmettes, sprays of flowers and other motifs radiate out and around the central medallion with larger long ovoid motifs at the outer edges of the field. The colors used include ivory, pale green, blue, and red/orange. There is some abrash or color change in the field color. 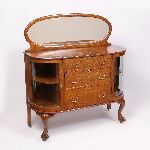 1325 COUNCILL FURNITURE MAHOGANY DESK: Banded mahogany top with string inlay over 3 drawers, shaped legs with carved shell decoration at knees, overall 30'' h. x 48'' x 25''. 1326 CHINESE CARVED INSET MARBLE TOP PLANT STAND: Round inset marble top with carved frame, floral motif pierced carved and shaped skirt, shaped legs ending in paw feet. Overall 33 1/4'' h. x 17 1/4''. 1330 APPROX 20-35 YR OLD TURKISH SOUMAK HAND WOVEN WOOL RUG, 5'5'' X 8'1'': This rug has an interesting design that includes stepped multicolored ''pyramids'' or triangles at each end of the ivory field pointing in to the center. A row of three footed dark colored vases with pale squarish buds come next and this motif is repeated in the main border of the rug. (They look like flying saucers!). In the center of the rug is a pale-yellow ovoid medallion. 1333 NORTH AFRICAN METAL MOUNTED BLANKET CHEST: Most likely Moroccan, hinged lid with tacked decoration, pierced copper panels at corner, interior with single box. Front with matching tack decoration, pierced copper panels at sides, over 4 lower drawers. Overall measures 25'' h. x 49 1/2'' x 25''. 1336 SIGNED ICART PHOTOGRAVURE FROM GARGANTUA ET PANTAGRUEL: The book ''Gargantua et Pantagruel'' by Francois Rabelais with illustrations by Louis Icart consists of 76 full page color photogravures, this is an example of one of those prints, sight size 8'' x 6'', pencil signed lower right, framed, 15.5'' x 13''. 1337 10 AMERICAN INDIAN PRINTS LARGE FOLIO FROM MCKENNEY AND HALL: 20.5'' x 14'' 1) Ochio Finico-Charles Cornelis; 2) Mo-Hon-Go Osage Woman; 3) Push-Ma-Ta-Ha Chactan Warrior; 4) Kish-Kallo-Wa Shawnee Chief 5) Els-Kwau-Ta-Waw The Open Door; 6) Wesh-Cub Chippeway Chief; 7) Red Jacket Seneca War Chief; 8) Meta-Koosega Chippeway Warrior; 9) Ki-On-Twog-Ky (Cornplant); 10) Major-Ridge Cherokee Chief; all unframed. 1338 10 AMERICAN INDIAN PRINTS LARGE FOLIO FROM MCKENNEY AND HALL: 20.5'' x 14'' 1) McIntosh Creek Chief; 2) Petalesharoo Pawnee Brave; 3) Naw-Kaw; 4) Tal-Col-O-Quit; 5) J-Aw-Beance Chippeway Chief; 6) Se-Quo-Yah; 7) Mah-Has-Kah Chief of the Ioways; 8) Chan-Man-I-Case Otto Half Chief; 9) Ong-Pa-Ton-Ga Chief of the Omahas; 10) Rant-Che-Wai-Me Female Flying Pigeon, all unframed. These color lithographs were from McKenney and Hall's book ''The History of the Northern Tribes of America''. 1340 FOUR MCKENNEY AND HALL INDIAN PRINTS: Seminole War Chief, White Nose Fox, Assue Chief, and Chippeway Squaw and Child by F.C. Biddle, sight size 15.5'' x 11'', all framed, 25'' x 20''. 1359 FINI, Leonor, (Argentine,1908-1996): ''Histoire d'O'' Image 12, Lithograph, image size 6.5'' x 9.5'', framed, 25'' x 21.5''. 1360 FINI, Leonor, (Argentine, 1908-1996): ''Histoire d'O'', Image 18, Lithograph on Ingres paper, framed, 25'' x 21.5''. 1366 FREE FORM BIOMORPHIC MID CENTURY SCULPTURE: Painted Resin Abstract Form, approx. 32'' h, 35'' affixed to a veneered marble plinth, overall 38'' h.
1368 ROCHESTER PONY PREMO #6 PLATE CAMERA: Leather wrapped box camera by the Rochester Optical Co., retailed by the New York Camera Exchange. Acme Anastigmat lens, overall measures 8 1/2'' h. x 8 1/4'' x 4''. Sold with a 6 3/4'' x 4 5/8'' plate and a 10'' x 8'' glass portrait. 1388 ILLEGIBLY SIGNED PAINTING OF HAYSTACKS: Oil/Canvasboard, sight size 8.5'' x 10.5'', signed lower left, gilded gesso frame, 13.25'' x 15.25''. 1390 9 FRANKLIN HEIRLOOM LIBRARY CLASSIC BOOKS: Each book with 1/4 embossed leather covers, matching cloth, gilt page ends. To include The Adventures of Huckleberry Finn, A Farewell To Arms, The Mill on the Floss, Great Expectations, The Great Gatsby, Don Quixote de la Mancha, Anton Chekov Plays, Henrik Ibsen Plays, Rhetoric on Politics. Sold with a red leather bound ''Repertorio Poetico'', Luis Edgardo Ramirez, published Caracas, limited edition number 1372/1500. 1393 2 HINDU INDIAN CARVED POLYCHROME MASKS: Late 19th to early 20th century masks, each with carved wood clad in painted cloth. To include a demon mask (18'' h. x 10 1/2'' x 7'') and deity mask (14 1/2'' x 9 1/2'' x 7 1/2''). 1396 KING, Michel, (French, 1930-): Dockside Scene, ''Chalutier'', Oil/Canvas, 21.75'' x 18'', signed lower right and dated 1967, signed and titled verso, original frame, 26'' x 22.5''. 1397 6 PIECE MERMOD JACQUARD SILVERPLATE TEA SERVICE: Each piece with embossed foliate motif. 1) Covered coffee pot measures 8.5'' h x 6'' dia; 2) Covered tea pot, 6'' h x 6.5'' dia; 3) Sugar & creamer, 3.5'' h x 4.5'' dia; 4) Covered waste bowl, 3.5'' h x 5.5'' dia; 5) Serving tray, 20'' long x 14'' wide. 1398 1927 CHARLES CLEMENT PILLING STERLING SERVING SPOONS: 2 English silver serving spoons in the original fitted presentation case, each hallmarked 1927, London, Charles Clement Pilling marks. 7 3/4'' long, case 1 1/2'' h. x 9'' x 5''. Approx. 4.2 troy oz. 1400 LARGE STAMP COLLECTION: Filling 3 scrap books, primarily consisting of US commemorative stamp blocks, hinged, the smallest book having some foreign stamp blocks as well. Nicely cataloged inside books with year of issue and block name. Larger 2 books measures 14 1/4'' x 12 1/4'' 2''. 1401 COLLECTION OF MURANO GLASS FRUIT, BOWL & FIGURE: A 14 piece assembled collection of Murano / Italian glass to include 1-12) Assorted aventurine fruits and vegetables to include pear, apple, orange, banana, cherries, pepper, gourd, garlic and more. Pear measures 5 1/2'' h. x 3 1/2''. 13) Deepest amethyst rectangular bowl with gold aventurine swirl, 3 1/4'' h. x 12 1/2'' x 8 1/4''. 14) Figure of a woman holding a water vessel, 11'' h. x 4 3/4''. 1406 SIMBARI, Nicola, (Italian, 1927-2012): ''Piazza Del Duomo'', Serigraph, 33'' x 36.25'', framed, 51'' x 47.5'', signed lower right. Nicola Simbari included geometric forms as well as architectural structures into his art work. 1408 VICTORIAN MARBLE TOP STEP DOWN VANITY: High Victorian arched crest with center decoration, carved frame to arched mirror, marble top step down center, flanked by marble top sides with 2 drawers each. All over 2 drawers, burl walnut veneer panels, doorknocker pulls. Overall 75 1/2'' h. x 46 3/4'' x 18''. 1416 2 DOOR PINE COUNTRY CUPBOARD: Stepped cornice, two 3/4 length glass doors, 5 fixed wood shelves, pegged and nail construction, overall 74'' h. x 53 1/4'' x 18 1/4''. 1417 WALLACE ROSE POINT STERLING CREAMER, SUGAR, & TRAY: 3 pieces total in the Rose Point pattern by Wallace to include open creamer (4 1/4'' h. x 7 5/8''), open sugar (4'' h. x 5''), tray (10 1/2'' x 5 1/2''). Approx. 12.8 troy oz. 1420 METAL & ALABASTER MAN WITH DOG SLED: Painted cast metal figure of a man, his dog sled and 3 sled dogs, affixed to carved alabaster base. Man with resin face, no visible markings, measures 6 1/2'' h x 14 1/2'' X 3''. 1421 GORHAM STERLING LOW SERVING BOWL: Embossed floral rim, fluted bowl. Monogrammed and dated 1886-1914. Marked with Gorham hallmark, Sterling, A2328. 2'' h. x 10 1/4''. Approx. 10.5 troy oz. 1422 DALI, Salvador, (Spanish, 1904-1989): Femme a Cheval, Hand Colored Etching, 9.25'' x 12.5'', signed in pencil lower right, numbered 12/145 lower left, fine custom framing 34.5'' x 30.5''. 1423 DALI, Salvador, (Spanish, 1904-1989): Femme a la Fontaine, Hand Colored Etching, 9.25'' x 12.5'', signed in pencil lower right, numbered 24/145 lower left, fine custom framing, 34'' x 30''. 1424 DALI, Salvador, (Spanish, 1904-1989): ''Biblia Sacra; Noah Who Planted the First Vineyard'', Color Lithograph, image size 19'' x 13.75'',signed and dated 1962 lower left, framed, 26.5'' x 31.5''. 1425 DALI, Salvador, (Spanish, 1904-1989): Thy Kingdom Come, Color Lithograph, image size 16'' x 13'', signed and dated, fine custom framing, 25'' x 27.5''. 1426 DALI, Salvador, ( Spanish, 1904-1989): ''The Family of Ruth, The Moabite'', Original Color Lithograph on Heavy Paper, image size 19'' x 13.75'', signed, fine custom framing,33.5'' x 28''. 1429 COUNTRY PINE BENCH: 17'' h, 54'' w, 15'' d.
1430 PRIMITIVE SINGLE DOOR COUNTRY CUPBOARD: Shaped crest over single blind door, wood latch, overall 63 1/4'' h. x 30'' x 13 1/2''. 1435 CHAGALL, Marc, (Russian, 1887-1985): ''Adam & Eve'', Lithograph, 10.5'' x 14'',, unsigned, framed, 27'' x 23'' . 1436 CHAGALL, Marc, (Russian, 1887-1985): Cain & Abel, Lithograph, 10.5'' x 14'', unsigned, fine custom framing, 26.5'' x 23''. 1440 FIGURAL ATLAS MIXED METAL ARMILLARY: Figure of Atlas in loin cloth supporting iron armillary spheres, missing arrow. Overall 27'' h. x 20'' x 16''. 1441 MATISSE, Henri, (French, 1869-1954): Bateau, Color Lithograph, image size 10.25'' x 14.15'', framed, 24.5'' x 21''. 1442 MATISSE, Henri, (French, 1869-1954): Verve II, Lithograph, image size 14'' x 10.5'', fine custom framing , 28'' x 24''. 1453 2 VICTORIAN PICKLE CASTORS INCLUDING FENTON: 3 pieces total to include 1) Fenton cranberry thumbprint glass castor set with tongs, overall 13 1/2'' h. x 5 1/2''. 2) Cranberry cut to clear jar, ornate castor with birds and bust medallions, mechanical lid, unmarked, with tongs 12 1/2'' h. x 4 1/2'' x 4 1/2''. 1456 SCHUTZ, Anton (German, 1894-1977): New York Stock Exchange, Etching, impression size 13.5'' x 10'', sight size with margins 14.25'' x 10.5'', pencil signed lower right, framed, 19.75'' x 15''. Schutz was the founder of the New York Graphic Society and some of his works can be found in the Smithsonian. 1464 MIRO, Joan, (Spanish, 1893-1983): Original Lithograph I, Image Size 9.75'' x 12.5'', framed, 21.5'' x 27''. 1465 MIRO, Joan, (Spanish, 1893-1983): ''Miro Engraver IV: Untitled 2'', Lithograph, image size 9.65'' x 12.5'', framed, 28.5'' x 25.5'' .